The legacy of iconic Cherokee artist and educator, Lloyd Henri “Kiva” New (1916 – 2002), is celebrated in the Museum of Contemporary Native Arts’ latest exhibition, Lloyd Kiva New: Art, Design, & Influence. Widely considered the father of contemporary Native fashion, New was selling his highly-coveted garments under the “Kiva” label throughout the 1950s. His classically modern designs incorporated his signature, brightly-colored fabrics hand-printed with Native symbols and repetitions of abstract and figural motifs. New brought that design sensibility with him when he left the fashion industry to co-found the Institute of the American Indian Arts (IAIA) in Santa Fe, and his artistic influence can be seen in the textile creations made by his students throughout the ‘60s and ‘70s. Drawn from the permanent collection of the IAIA Museum of Contemporary Native Arts, many of these large, student textiles hang prominently within the main gallery of Lloyd Kiva New: Art, Design, & Influence. 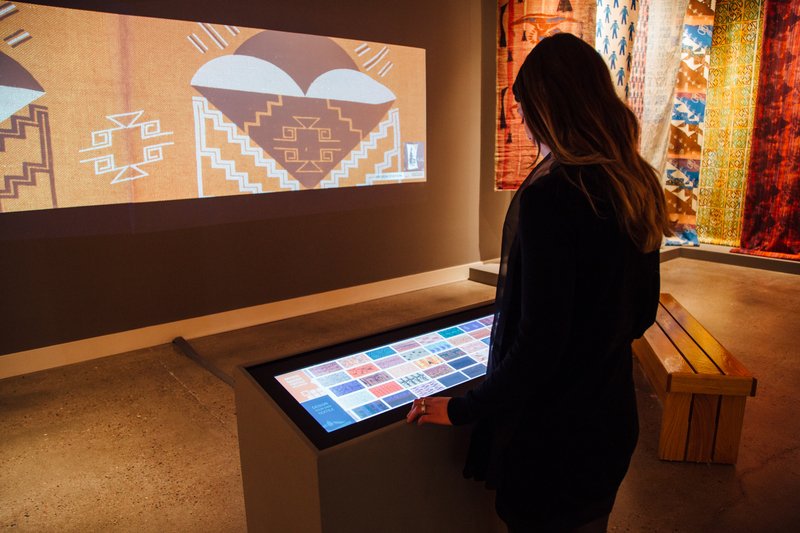 Ideum collaborated with IAIA and MoCNA to create an immersive application for this exhibition that both allows visitors to browse IAIA’s student textiles and digitally experience the printmaking process by creating their own textile in New’s signature style. Surrounded by floor-to-ceiling student-made textiles, the application is located centrally within the exhibition’s main gallery, and runs on a custom Ideum 38-inch stretch touch monitor. 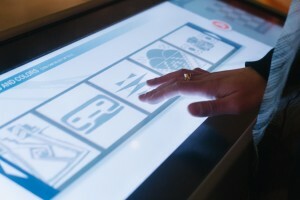 As visitors engage with the touch screen, their selections are projected at a large-scale on the wall in front of them. While the experience is best suited to a single user, others within the gallery space sit and observe the creative process before jumping in themselves. 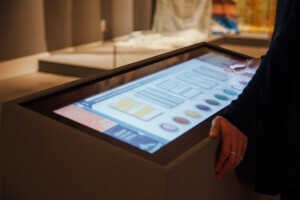 Within the collection viewer, as visitors browse and click on student-made textiles, their selections are projected on the wall. New high-resolution photography of all the student textiles in IAIA’s holdings ensured that the imagery would appear sharp at a large size, and that the color would be true to the actual textiles in the space surrounding the application. 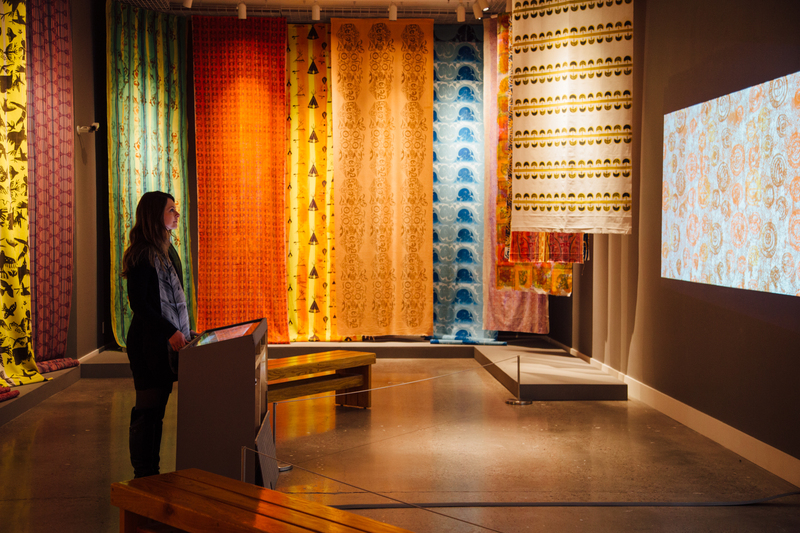 Inspired by the textiles hanging on the gallery walls as well as those in the collection viewer, the textile creator function allows visitors to then digitally experience the textile making process. Visitors remix design motifs and colors pulled directly from the student textiles themselves. As visitors make selections from materials to patterns and colors, their choices are projected on the wall in front of them. With oversight from IAIA’s curatorial team, Ideum’s designers painstakingly pulled specific elements—backgrounds, patterns, and color palettes—from the IAIA textiles for use in the application. The decision to use student-created patterns was made for several reasons. New often used traditional Native motifs in his designs, but he avoided using sacred images and symbols. When it came to matters of cultural appropriation in the world of fashion, he was a strong proponent of going right to the source—buying directly from Native designers and artists or collaborating with them with them whenever possible. By remixing the student designs made under New’s purview rather attempting to creating new patterns without the benefit of oversight from Native designers, we were able to uphold those ideals. 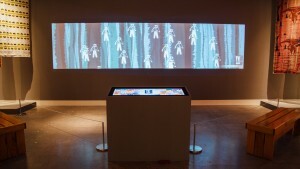 Beyond that, textiles made with the Lloyd Kiva New Textile Viewer and Creation Interactive look like fitting additions within the exhibition gallery, and not like imitations. This feeling of authenticity further reinforces the visitors’ connection to Lloyd Kiva New and the part they play in his legacy. Before saving their work, visitors have the option to further personalize their textiles by arranging their selected motifs into various layouts, and then resizing or rotating said layouts. Finished textiles are saved to Tumblr so that visitors may share on social media. Textiles are also saved locally so that visitor creations are displayed on the gallery wall when the application is not in use. This attract screen loop draws in visitors to start the design process anew.